Brimfield is located in south central Massachusetts. We are central to all fields, look for our NE MOTEL banners and our green and gold umbrellas. Take Mass Pike East to Exit 8 (Palmer). Take right after toll booth, go to first intersection and take a left onto Rt.2. Follow signs to Brimfield . Look for our green and gold mushroom umbrellas at our food court. Turn left at New England Mote Antique Shows. Parking central to all fields. Take Mass Pike to Exit 9 in Sturbridge. Take first exit after toll booth to Rt. 20 West to Brimfield. Look for our green and gold mushroom umbrellas at our food court, turn right. Parking central to all fields. 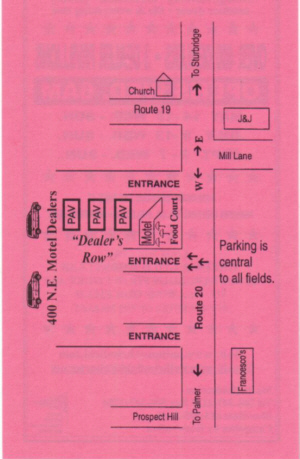 On-site parking, central to all fields is available. New England Motel & Antiques Market, Inc.